Club Doncaster Foundation would like to extend its thanks to the volunteers who help and allow the Foundation to challenge, inspire and motivate people across the Doncaster Region. Much of the work delivered by the Foundation would not be possible without the continued support of volunteers, who take the time out to aid and assist in making sure the impact across the four areas is as good as it can possibly be. International Volunteer Day highlights the important contribution of the volunteer service, something which Club Doncaster Foundation volunteer coordinator, Alex Hobson, thinks should be more widely recognised. He said: "Volunteering is at the heart of everything we do here at the Foundation and it is a real pleasure to see the impact that volunteers can have, both in terms of their development, and what they bring to the Foundation." Alex oversees the volunteer programme, an initiative designed to allow people to continue their own development whilst helping others. "The reason I volunteer is to try and give something back to Fit Rovers, I have benefited massively from taking part so I want to get the message out to others so that they can have the chance". Bob Allan, Fit Rovers Vet and volunteer. "When I was at college I had no idea what career path to follow. I started volunteering within the foundation and instantly knew I wanted to pursue a career in coaching. Volunteering set me up perfectly to do that, the Foundation paid for me to go on the FA Level One Coaching Course, since then I have progressed onto a coaching apprenticeship at Club Doncaster Foundation and I am now working towards my FA Level Two. Volunteering definitely changed my life and I can't recommend it to anyone enough." Craig Weir, former volunteer & Second Year Apprentice. "I had recently completed NCS with Club Doncaster Foundation and was looking to continue some sort of social action. I had worked with Alex (Hobson) during NCS and he had mentioned a couple of different opportunities to get involved within the Foundation. As a Rovers fan, the opportunity to get involved with the good stuff the Foundation do on a match day sounded ideal." Oscar McConway-Gee, Kicks and match day volunteer. 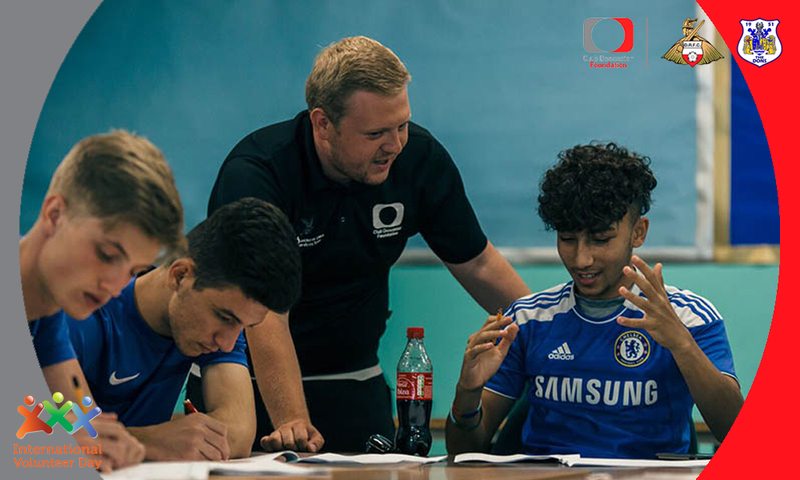 "As a student at Club Doncaster Sports College, tutors are always saying we should get involved in volunteering. Since I've started volunteering in schools I really do appreciate the impact that volunteers can have. I really feel part of the team here and putting volunteering on my CV is going to look great after college." Jack Stobart, Premier League Kicks and Schools volunteer. "I've recently got into volunteering with the Foundation and I'm really enjoying getting to know the PL Kicks programme. Kicks is such a great programme to be part of as I can really see the impact the sessions are having. "To be part of a session that is so well attended really makes me enjoy volunteering and the skills and experiences I am picking up are really making me want to carry on and work towards a career in coaching." Wade Robson-Webster, Premier League Kicks volunteer.